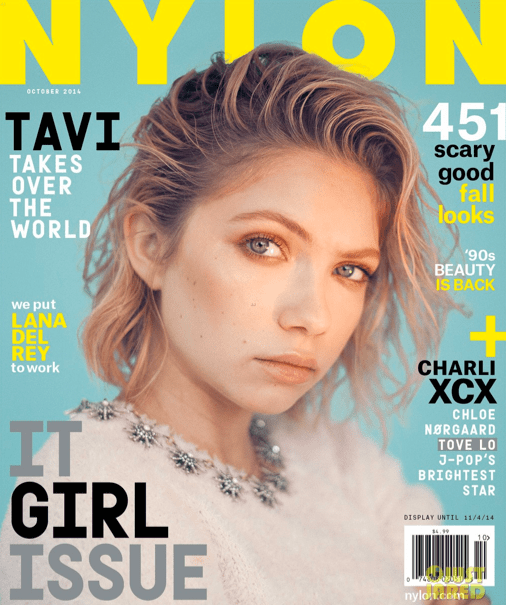 Even though Tavi Gevinson is only 18 years old, she’s already made a name for herself in the fashion, writing, and acting industries, and she’s only going further. Gevinson came to the public attention at the ripe age of 12 because of her now defunct fashion blog, Style Rookie. The blog featured the young girl in various outfits of her creation and her commentary on the fashion trends of the day. Now you’ve got to remember that this was before everyone thought that blogging could be the fast track to fame. She did it because she liked it, and she started pulling in the views, as many as 30,000 a day. Her dad didn’t seem very interested in her hobby until one day she asked her parents’ permission to be interviewed by the New York Times as a part of a young bloggers article. Talk about a news flash! In early 2011, she moved from writing primarily about fashion to other things, and thus Rookie Magazine, Tavi’s online ‘zine geared towards teens and young adults, was born.The site is mainly written by teenage girls, but sometimes features advice from hand-selected adults (like Tavi’s dad!) among other things like fiction, book excerpts, and photo sets by young photographers. As a frequent reader and commenter myself, I give it an A++. The site went offline when the first Rookie Yearbook was published. The yearbook was a compilation of some of the best posts on the site of the year. Tavi is currently editing the 4th edition of the book. It’s hard to believe that success could come at such an early age, but the way Tavi has handled it is an inspiration to all young girls who still believe that they have to wait until they are older to do something. Nowadays, Tavi is being interviewed by the likes of The Coveteur and NYLON magazine, and she’s also acting on Broadway alongside famous faces like Michael Cera and Kieran Culkin. Youth is the mark of this It Girl, but don’t let her fool you. She’s totally legal now and ready to take on the world because when you have nowhere to go but up, the sky is the limit. Who do you think is an It Girl? Nominate your leading lady and maybe I’ll write about her here. All highlighted links are the sources I obtained my information from. All photos are the result of a search engine and I do not own them. If you see your pictures, please contact me so that I may take them down. Oh I love Tavi, She´s just that kind of inspiration a young girl needs in her life. Thumbs up! Love Alexa Chung and Kate Moss. I haven’t heard of Edie though. I will have to look them up. Tavi is most definitely an IT girl, and has been for quite a while now. Good for her! I actually learned of Tavi in that issue of NYLON and I’ve been a fan ever since. It’s amazing how much she has accomplished!